The event was a resounding success with over 300 delegates attending over the two days to view 13 exhibitions on display and listen to 34 presentations by Australia’s leading minds and experts. A Welcome Reception, supported by the Insurance Council of Australia (WA), was held on the evening of Tuesday 5 May and provided delegates an opportunity to mingle amongst the exhibits and discuss the day’s sessions. Commissioner Wayne Gregson sharing his expertise on the importance of leadership in the Department of Fire and Emergency Service’s journey in managing sick and injured fire fighters. Global futurist and broadcaster, Dr Keith Suter, providing an interesting perspective on future workplace challenges and responses to workplace injury. Mental Health Commissioner Timothy Marney sharing his expertise on the important role the workplace plays for those suffering mental health issues, from prevention through to recovery. Paralympian Brad Ness sharing his personal return to work story after becoming a below the knee amputee following a workplace accident at the age of 18. For a full list of speakers please visit the Injury Management Conference website. 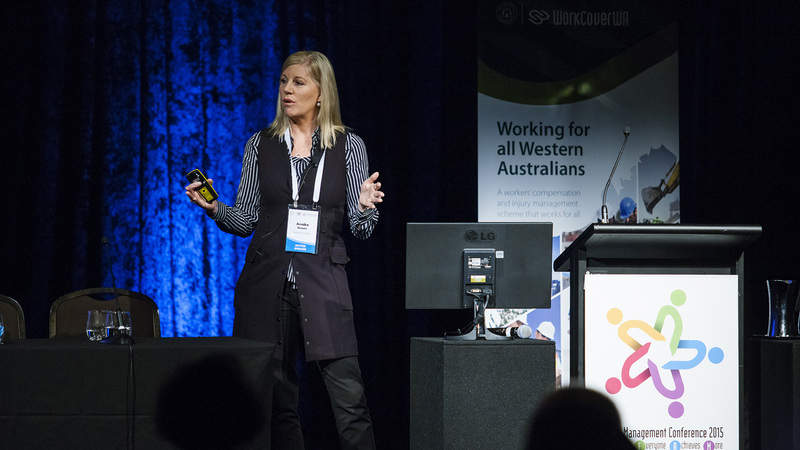 WorkCover WA would like to thank all the speakers, exhibitors and delegates for their contributions in making the Injury Management Conference 2015 a resounding success.ed.